What is so magical about Deadvlei? There's something wonderful about the orange dunes and almost abstract-looking dead trees of Deadvlei. But what makes this place so special? Before we try to answer the question above, we have to learn a little more about this once lively and green, but now arid and inanimate, yet beautiful landscape. 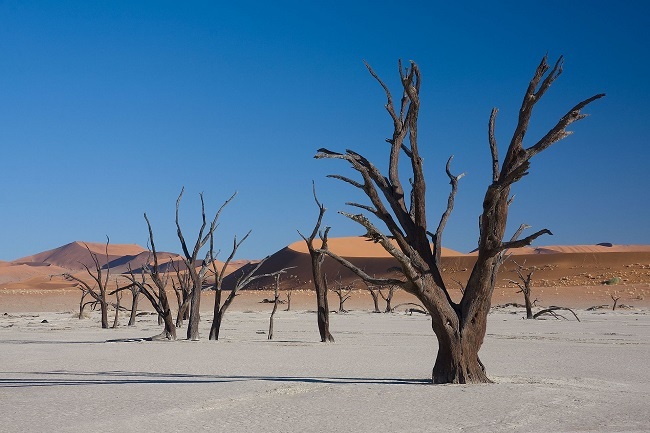 Deadvlei lies in the Namibian desert, and is basically the now dead remains of a once lively, fen-like habitat. The clay pan formed as the flooding Tsauchab river created temporary shallow pools, where there was enough water for the acacia trees and other plants to take roots and grow. But as the climate changed and the area became permanently dry (with the dunes blocking the river from the pan), the trees could no longer get sufficient amounts of water, thus died. Many of the blackened trees were still alive 600-700 years ago, and the mere reason we can still see their trunks and dried - but not petrified! - branches is that the area is so dry that the wood does not decompose. The almost unlikely black color of the tree trunks is due to the many hours of intense sunshine. The area is surrounded by some of the highest sand dunes in the whole world: their height can exceed 300-400 meters, and their average height is 350 meters. The color of the sand dunes is equally interesting - it ranges from deep yellow to warm orange. Deadvlei is quite famous among photographers, thanks to it's ghostly appearance - and one more, rather "artistic" reason. The yellow and orange dunes blending into the deep blue skies right behind the black trees is making it possible to shoot a spectacular image, thanks to the complementary colors and the diverse shapes.